Drive traffic to your Upper Peninsula Business! Upper Peninsula Online Furniture Sales - Bedroom Furniture, Dining Room Furniture, Mattresses and more! Web Design for Tourism and Chamber of Commerces! U.P. Wide Adventure Guide with Kelly Nightlinger! Fishing Guide! Hunting Guide! Many people search for travel info, business opportunities and information. The N.Y. Times emailed Superior Sights about a story centered upon Hunting Lodges. We provided the Times with the story lead & our photography services. Click here for photo. Summertime the Upper Peninsula of Michigan is the greatest and most exciting place to plan your vacation. The Upper Peninsula is a vast wilderness full of adventure and rustic lure. Your Upper Peninsula Web Connection for Snowmobiling, Travel, Michigan Lodging -Motels & Hotels, Camping, Bed and Breakfasts, and More! From the Porcupine Mountains to the Mackinac Bridge, journey to a place filled with wilderness, wildlife, attractions, and Upper Michigan hospitality! A Michigan Summer Vacation - both in the Upper Peninsula and Lower Peninsula can be planned with the aid of SuperiorSights.com. Vacations in Michigan are spectacular with Munising's Pictured Rocks, Curtis's Seney Wildlife Refuge, Newberry's Tahquamenon Falls, Sault Ste Marie's Soo Locks and St Ignace's Mackinac Bridge! Come and explore all of incredible places full of wonder and excitement! 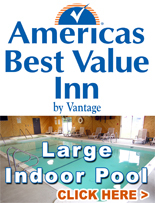 Michigan Lodging, Michigan Travel, Michigan Photos, Michigan Vacations - We are your #1 Michigan Resource for information, websites, lodging, photos, and stories! 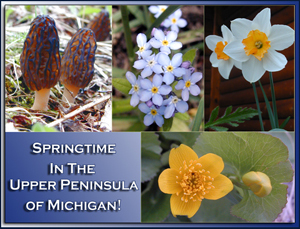 Get ready for summer in the Upper Peninsula! Superior Sights of Upper Michigan highlights area businesses, organizations, nonprofits and more! Our huge collections of pictures of the Upper Peninsula communicate our love for the land & animals. Click here to visit our Upper Peninsula ATV & ORV page made for the All Terrain Vehicle enthusiast! Here you will find great ATV / ORV information, photos, more! Travel amongst the Great Lakes and you will find a variety of lodging and recreational activities. 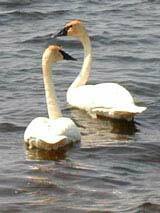 We offer snowmobiling, golfing, birding and we have beautiful hotels, motels and bed & breakfasts (b & b's). Whether you're planning a vacation, seeking a business opportunity or considering a move, our web site can help. Check out the many cabins and campground listings for your browsing. Plan Ahead! Visit www.upsnowmobiling.com - This is a great resource for up to date snowmobiling information on trails and reports. We have a link to the Upper Peninsula Snowmobile Trail Map there also! Have a great winter in the U.P.!! Discover what God's Country has to offer. Michigan and it's unique Upper Peninsula - A True Vacation Paradise! Check out all the our city pages and find the Summertime Adventure that fits your needCome and explore our spring and summer season in Michigan's Upper Peninsula! See our real estate agents and contractors for locating or building a new home. Visit our hunting and fishing shops & guide services that can assist you in your plans. Superior Sights is a web directory committed to the success of Tourism in Michigan. 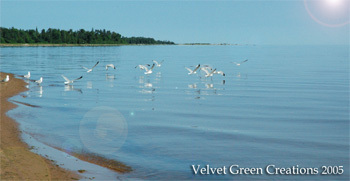 Visit us at our web sites: www.superiorweb.net & www.velvetgreencreations.com. U.P. Photo on upper right taken in the Seney National Wildlife Refuge of Michigan and is made available for your viewing pleasure through the courtesy of Velvet Green Creations - click here to see our photo services. Also visit us for our web design services! Michigan Web Designers with you and your business in mind! Michigan Snowmobiling Rentals, Organizations, and Info. Sportsman & fisherman will love the Eastern U.P. Protected wetlands offer marshes for blue herons, moose, swan, and more in the Seney National Wildlife Refuge and surrounding areas. Beautiful streams like the Two Hearted River cultivate minds like that of Earnest Hemmingway. Rivers, lakes & waterfalls cascade throughout the Western U.P. like the Porcupine Mountains, Lake of the Clouds, Lake Gogebic & The National Forest nature and wildlife.The U.P. 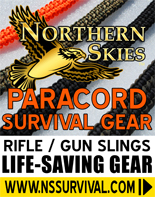 has excellent State and Federal land for fishing and rifle or bow hunting seasons. Hunters and fisherman will find a variety of lodging, campgrounds or bed and breakfasts (b&b's). The whole U.P. is great snowmobiling terrain! Lake Superior offers beaches, agates, dunes, lighthouses, Whitefish Point, The Shipwreck Museum, Pictured Rocks National Lake Shore and more! Travel to Marquette, where the moose and wolves flourish. Rock collecting, birding, snowmobiling, and the fine art of trout fishing await your visit. They have great cabins, bed and breakfasts (b&b's), campgrounds and unique accommodations. Snowmobile this great white north and see why we are number one in snow sledding! Michigan Websites and Nationwide Advertisers - Get Listed With Us! We rank exceptionally well in Michigan. We receive a growing amount of traffic with thousands of visitors everyday! When we Web Design for your company - you receive listings and banner ads for free - please call or email for details! the written permission of Chris and Gina Harman. Superior Sights is not responsible for third party websites.